No, this isn’t another corny November election pitch. I’m talking about hope during National Diabetes Awareness Month this November. What better way to foster hope than to write letters to the families of newly diagnosed T1Ds? You can learn more about @mumoftype1’s (Maureen’s) kindhearted project, Letters of Hope, by clicking here. Firstly, I want you to know that whatever you are feeling- anger, sadness, fear, anxiety, exhaustion, cautious optimism, a mix of all of the above- is totally okay. Even many years removed from the hectic time of a type 1 diabetes diagnosis, you are still allowed to feel these things and to express them out loud, if you so choose. Not everyone will “get it,” but some good eggs will rise to the occasion and offer support. The aspect of diabetes that is not discussed enough is how you will see the light in others, and yourselves, more clearly now. Empathy is just as important of a prescription as insulin. Life will go on, with some adjustments intertwined to ensure safety. If your child was diagnosed with T1D, allow him/her to go to diabetes camp, or sleepovers, or field trips. Have a preparedness plan in place: extra diabetes supplies packed, phone numbers to be reached in case of emergency, teachers who are aware of the diagnosis and know the basics of how to help. Freaky diabetes situations will pop up from time to time, but trust in your knowledge and abilities to take care of things and to move forward. Sometimes diabetes just has a mind of its own and you did not do anything wrong to deserve it; every new morning is a “reset button” where you have a clean slate to try again. Above all else, your child will still get to be a kid, to enjoy school and sports and playdates. If you are the type 1 diabetic of any age, you will continue to be the person you were before diagnosis. Your perspective will change for the better; suddenly you will understand just how strong and resilient you are. Words matter. We “check” blood sugar, as “test” implies pass/fail. “Manage” rather than “control” diabetes. Remember that blood sugar numbers are not “good” or “bad”; they are a guide for making informed treatment decisions. The person’s character is never implicated by a wacky blood sugar value. It’s type 1 diabetes; wonky numbers will happen, and you will handle them- sometimes gracefully, other times not so much. Remember that your job as a person with diabetes, or as a caretaker, is more complex than most people would ever realize; go easy on yourself. Offer guidance in a supportive manner, rather than lecture. The islet cells have misbehaved, leading to type 1 diabetes; but the person is never to blame. Even if there are days where diabetes management seems to slack, remember what it was like to be a teenager yourself. Be understanding. Do not try to rewrite the diabetes wheel all at once. Hone in on one time of the day that seems to need improvement- breakfast, perhaps- and start there to make the process manageable. Diabetes discussions are inevitable, as you may collaborate on insulin dosing decisions, carb counting, and similar technical items. Yet once you sit down for a family meal, try to leave diabetes behind. T1D gets enough air time each day. Dinner is for enjoying one another’s company, laughing about the funny anecdotes from work or school, being a family that is so much more than the diagnosis of a health condition. Reserve that time for yourselves. Take vacations and splurge a little; added insulin will cover ice cream for dessert, and your kids will thank you for giving them that freedom one day. If and when you want peer support, there is a large, engaged community online- from Facebook groups to blogs to the diabetic online community (#doc) on Twitter. These online interactions can lead to in-person meet-ups. The friendships are real and the bonds are solid, whether they are formed online or offline. We are here for you. Although we have not met you in person, we are thinking of you and praying for you during this time of transition after diagnosis. Sending love, and extra coffee! I’m not the first one- and I certainly won’t be the last one- to say that in the context of any chronic disease, the term “control” needs to be replaced by “giving it your all.” Our choice of words affects how we emotionally-process the inevitable rises and falls of everyday life with a health condition. We cannot simply throw a lasso around a chronic disease and call it a day, so let’s make a concerted effort as patients, health care professionals, and most importantly, human beings, to honor the effort that it takes to live with chronic disease through our choice of words. When I Grow Up, I Want to be a… Patient! On my hour-long drives to reach my diabetes clinic, I have been reflecting a bit more on one of my leading roles in life: playing the part of the patient. What does this mean? In high school, it simply meant showing up at the doctor’s office a few times a year, rolling my eyes as the medical staff gave advice, and grumbling to Mom on the car rides home about how unfair it was that I spent my Christmas break getting blood drawn while my friends were back home goofing off at the local shopping mall. (Someone give me an Academy Award, right?). If you ask a classroom full of kindergarteners what they want to be when they grow up, you’ll hear: “Firefighter!” “Policewoman!” “Doctor!” “Mom!” “Dad!” “Astronaut!” and other ambitious goals called out. You probably won’t hear “Patient” mentioned. Being a Patient is not an occupation one normally chooses; rather, we are chosen. And we rise to the occasion. (Yes, Grammar Police, Patient deserves a capital “P” because it is a 24/7/365 job and it takes incredible strength to play this part). When I was almost three years old and my biggest concern was building snowmen outside, diabetes chose me. While my parents handled the majority of my care in childhood, I was simply along for the ride. Now as an adult tasked with keeping myself alive despite a rebellious pancreas each day, I do have a choice: to sit back and get dragged by my hair when the diabetes roller coaster comes barreling towards me, or to take a deep breath and give it my all as a Patient. It just sort of happens that this fight becomes a part of your heart and soul. Whether used in the context of diabetes, cancer, arthritis, heart disease, or simply a head cold, the term “patient” can carry a negative connotation in some regards. Patient? You must be sick, then? You might be lower on the totem pole of power than the doctor, nurse, or other health care providers treating you at the office? You are not as “in control” as you would like to be? Perhaps that control is in someone else’s hands at your medical appointments? Let’s look on the positive side for a minute, though. (See ya, Negative Nancy!) Being a Patient is empowering. Look no farther than the diabetic online community (DOC) if you need any concrete evidence. We are more than the “patient as an occupation” title. We are pillars of strength for one another while balancing our other jobs in life. Playing the role of the Patient is part of us, and this purpose in life is something to embrace. Even if one day that elusive cure finally gets figured out by a brainiac doctor, I believe that our hearts will not change; we will continue to be Patients, whether for our own health situations or for those of others who need our assistance, no matter the medical conditions. Fighting for my health has become such a part of my life that somewhere along the journey I fell in love with advocating for myself as the patient, with giving it my all and expecting to get the same effort back from my health care team. In recent years I have taken on a more active role as the Patient: printing out my own continuous glucose monitor (CGM) charts prior to my appointments and eating lunch with one hand while clutching my cell phone to my ear with the other hand- briefing my insulin pump representative on what I believe to have identified as a product defect. You get the picture. I’m involved in my health care, to the point where some days I wear myself out obsessing about a disease that can indeed be tamed, but never completely tied down. As I drive away from my endocrinology appointments, I often wonder, How do they do it? How do my doctors and nurses maintain composure while they comfort us in the face of human suffering each day? But there is also more to that story. There is the Patient who is on the receiving-end of the suffering, too. Perhaps doctors and nurses go home and wonder, How do THEY do it? How do our Patients fight that battle each and every day? The simple answer is that we all do it. We put on our game faces and we march on, even on the bad days. We do this for ourselves and for each other- for the respective roles in life that we all play, whether Doctor, Nurse, Patient, Caregiver. Being the Patient is hard work. It requires blood, sweat, tears, urine labs, lack of sleep, hunger, thirst, and more tears. It also requires humor and perspective if one is to keep on, keepin’ on. Honesty is the best policy, but it is also a vulnerable one. “This is where it hurts” gets caught in my throat many days. Sometimes it is easier to hike up my shirt to show my doctor a bruised insulin pump site than it is to tell her about the other types of pain- about why too much or too little insulin keeps me in a mental purgatory of sorts. When she touches at that particular pain, I might not stand as still and as stoic as I do for the needles. Recently, my internal mantra when I go to see my doctor is try to be honest with your feelings. Not in the sense that I ever maliciously lied to doctors before, but more in the sense that perhaps I was not yet ready to be open and to expose all of my struggles previously. Maybe I was so hung up on tweaking my overnight basal insulin rates that I was disregarding that my breakfast boluses were in need of immediate assistance? Even if I have to begin with small, “baby Tylenol” doses of readiness, starting somewhere counts for a lot more than never starting in the first place. We are all together in a great sea of blue, and if I do say so myself, blue looks good on us! Who doesn’t like watching the blue ocean waves crash along the shore? Who hasn’t wondered what goes on all the way across the pond? We all know that diabetics wake up and fight every day in every corner of the globe. That is why blue unifies us. Now it is our time to tell others about our lives with diabetes. No matter the type of diabetes, we share a universal goal of taming the diabetes beast, living well, and supporting each other. We dream of a cure together. We know that the potential for a cure is there. We want future generations to speak of diabetes as a mythical monster that some brave souls once crushed into the soil, never to hear from it again. There are plenty of wonderful research and advocacy endeavors going on right now. We all have our personal favorites and I encourage any cause that lessens the burden of this disease. Today, I ask you to take a moment to look at the Faustman Lab at Massachusetts General Hospital. For those of you who do not know Dr. Faustman, suffice it to say that she is a phenomenal, witty, kindhearted, passionate human being first and foremost, and these qualities make her an innovative doctor. I am a bit biased, but I would love to see her cure this disease. If you are unfamiliar with the Faustman Lab, please check out their website at faustmanlab.org. If you are looking for a new cause to support, forego your morning cup of coffee and instead send a few dollars to Faustman Lab. If you already support the Lab, please continue your support. The research is promising, the process is not invasive, and the team behind it is fully dedicated to conquering autoimmune disease. I am not a scientist, but I believe solving the complexities of one autoimmune disease will be to the benefit of many other diseases, whether defined as “autoimmune” or not. The more we understand about the malfunctioning of the human body, the better. Thank you for your support, and I truly hope that everyone enjoys World Diabetes Day 2014 whichever ways you choose to celebrate. May your blood sugars be stable, your bodies and minds able, and your hearts basking in the glow of the diabetes “label”- for this one day, at least. Own it! Truth be told, I haven’t posted as much because I’ve been a little too Negative Nancy and not enough Very Light, No Sugar for my liking. Consider this an apology of sorts. This disease, in my adulthood, has changed me. I miss the carefree kid in high school who was a dorky, yet extroverted, fun-loving person. Nowadays, I don’t know what happened to that girl. I’m still Ally, but on the rough days, I’m Angry Ally. “Anger is a secondary emotion,” my friend said last week, when we chatted about the typical emotional twenty-something-year-old female stuff. I have always known that, but the way she said it just stuck with me. She’s right. There’s more depth to my anger. I’m hungry, for starters. On the bad pump days when my blood sugar hovers in the 250s and 300s, I avoid carbs as if they were the Grim Reaper. Sometimes it takes the entire day to recover after a pump problem, and I have just adapted to the growling in my stomach and the hunger pangs lodged in my ribcage. “You look skinny to me- skinnier than when I last saw you. It’s all of this ketone stuff with the pump, huh?” my nurse asked gently as she tried to identify good insertion sites for the pump. “No. I’m actually gaining weight from the grad school diet,” I defensively replied, convinced that she was wrong. That night I stepped on the scale and was surprised to see the 5-pound weight loss. While it is an easy coping mechanism for all of us to laugh it off and say, “Well, maybe ketones bring one positive to the table,” the reality of that statement is that it is not a joke. Losing weight due to ketones is never a good thing. It is your body burning fat for fuel. It is another painful pump site because you’re out of cushioning. It is how diabetic eating disorders can begin, and it is harmful to the body no matter the circumstances leading up to it. Full disclaimer here: I wholeheartedly intend to eradicate ketones from existence whenever possible, and I would rather gain some pounds than suffer one more day with ketones. But I am mindful of how easily this could escalate into a larger problem. I believe that this is an issue that needs to be discussed more often in the diabetes community, so here is my limited knowledge on the topic and my best effort to get a more open conversation going. If you believe that you may have an issue related to this topic, please know that you are strong and that you owe it to yourself to feel better by getting help. Beep, beep, beep. Snooze. Ten more minutes. No, eleven. No, thirty-five. Yawn. Working fulltime, grad school at night, and driving to Boston regularly while figuring out the diabetes dilemmas are exhausting in and of themselves. Then, as we all know, diabetes loves to come out to play from dusk to dawn; it’s like a Great White Shark or something. In other words, it is a large nuisance with a ferocious bite. 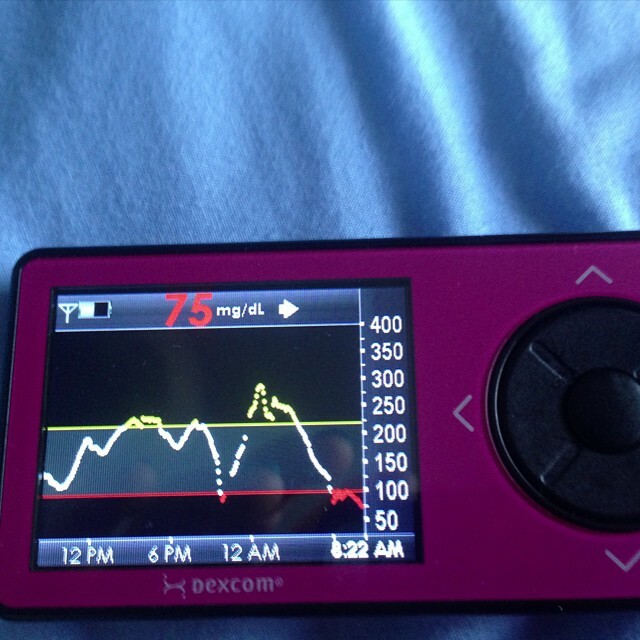 We’ve all been there: Head on the pillow, deep breath, fading into sleep, and then… EEEEEE EEEEEE EEEEEE from the Dexcom on the nightstand. Dexcom is like the loyal dog which never strays from its owner, and I am so thankful to have access to this lifesaving product. (It’s as good a time as any to remind us about #MedicareCoverCGM, right?) But it is just another example of the many ways diabetes disrupts our rest. Being tired and hungry, for me at least, means that my patience threshold is running on vapors by 10:00 am most mornings, no matter how many very light, no sugar coffees are consumed. Little problems seem like big ones when all you want is pizza for lunch but you know that salad with a few miniscule pieces of chicken is your untimely fate for the day. I admire the people in the DOC who are open about their emotional struggles with this disease. It takes true guts to be vulnerable to that degree. So, yes, I have a front row seat in the fan club for, well, all of you. It is difficult to come to grips with one’s own emotions at times, but in the long run it provides a healthier mental and physical outcome, if history and science are any indication. Although being Negative Nancy is not fun, maybe I should also give myself some slack here? Diabetes is a daunting, never-ending job, and those outsiders who say “Laughter is the best medicine” probably haven’t tried to laugh when they have moderate-to-large ketones. It’s just not happening, people. But I can promise to attempt to tap into that whole thing called “perspective” that diabetes gives us a bit more often. We all know that little things aren’t the end of the world because we have already lived through the end of the pancreatic islet cell world. Badasses. Thanks for putting up with my grumpy tweets. Sometimes it just helps to be heard. Diabetes Awareness Month is finally here! I’ve stocked up on blue apparel and drafted, re-drafted, deleted, expanded, and re-visited my Facebook status updates, tweets, and so on for World Diabetes Day on November 14. Being new to the diabetes blogosphere/social media arena, I feel the importance of November, and specifically November 14, more so than I may have in the past. This is our day and our month. I’m clearly biased here, but I do not believe that diabetes gets its fair share of attention in society and in the media. Take a gander at my diabetes rant if you want my heated feelings on the matter. I am truly happy for other organizations and causes that garner lots of fanfare during their designated months and days. Seeing the State House lit up in pink for breast cancer awareness month in October as a simple gesture of solidarity for the cause always puts a smile on my face. My siblings’ delight in dumping ice water all over me for the ALS Ice Bucket Challenge is a fond memory for our family, and it is also a reminder of those very brave individuals who battle an insidious disease every day. As human beings, we all suffer. Lots of us have health conditions; others, financial troubles; some, relationship issues; many, a mix of a multitude of things. Connecting as human beings to support one another in our moments of pain and in our moments of triumph against such pain is all part of the human connection. It is time to make that connection happen for diabetes, and the diabetic online community is certainly capable of moving mountains to do this. There are various creative diabetes awareness efforts going on right now. I am all for anything that supports diabetes in a positive way, and I truly enjoy participating in various efforts when time permits me to do so. However, we are also a bit fragmented as a group- not because we want to be, but because the options are too vast and our passions for advocacy too wide and multifaceted. This is not necessarily a bad thing. It speaks volumes about us as an intuitive, determined community. We are always salivating over new and improved ideas for advocacy. Rather than making things more complicated and diluting the already-expansive efforts to raise awareness, I’m going to put a simplified twist on an old diabetes advocacy message. We have all seen those posters outlining how many injections, pump site changes, finger pricks, etc. that a diabetic has endured over his or her lifetime. Those posters always knock the wind out of me- no matter how old the person holding up the sign may be. There is a universal truth to these visual aids: One shot is one too many. If we cure diabetes, there will never be another “first shot” of insulin for so many out there whose islet cells may one day rebel. Sadly, as we all know, the shots are sometimes the “easiest” part when it comes to diabetes. Again, #1ShotIs1TooMany. We can live in a world without diabetes. It is a matter of hard work, advocacy, financing, and research. As the doc, we already know the ropes when it comes to informing others about our daily lives with diabetes. But those who do not live it firsthand- who do not wake up at 3:14 am to change failed pump sites, who do not feel the burn of injecting into scar tissue, who do not wipe their child’s tears during a bad low blood sugar- have perhaps not been exposed to the reality of diabetes. My tactic is simple: “Shock and awe” is good, occasionally. From a marketing perspective, tease your social media followers a bit. Engage them by throwing out the line and seeing if they will bite. 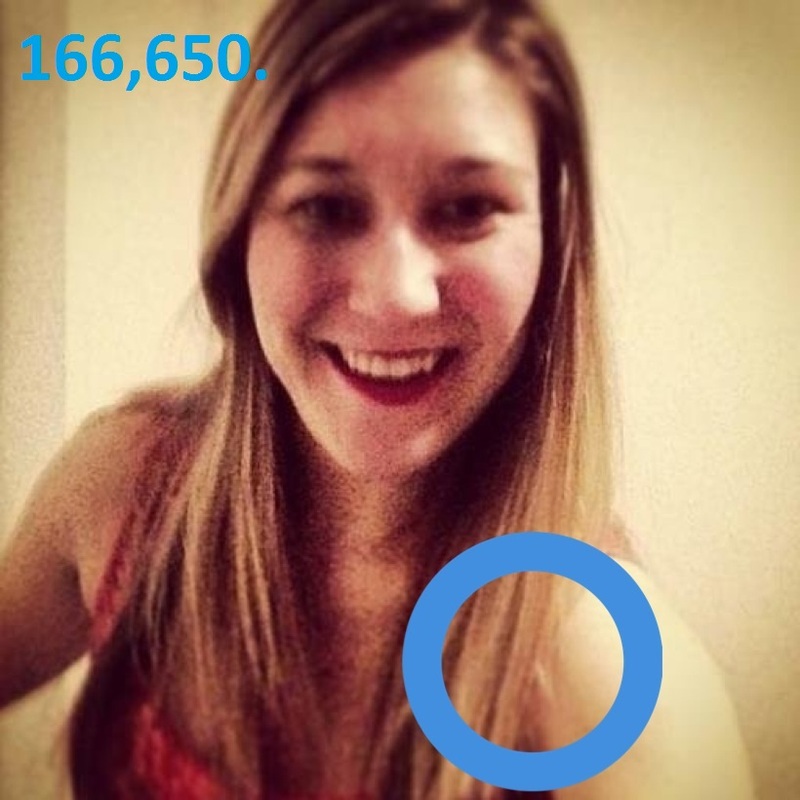 I plan on posting my picture with the blue diabetes awareness circle etched in using the World Diabetes Day app. In Paint or a similar program, I will then write in blue the number of needle pokes I have endured over 23 years as a type 1 diabetic. 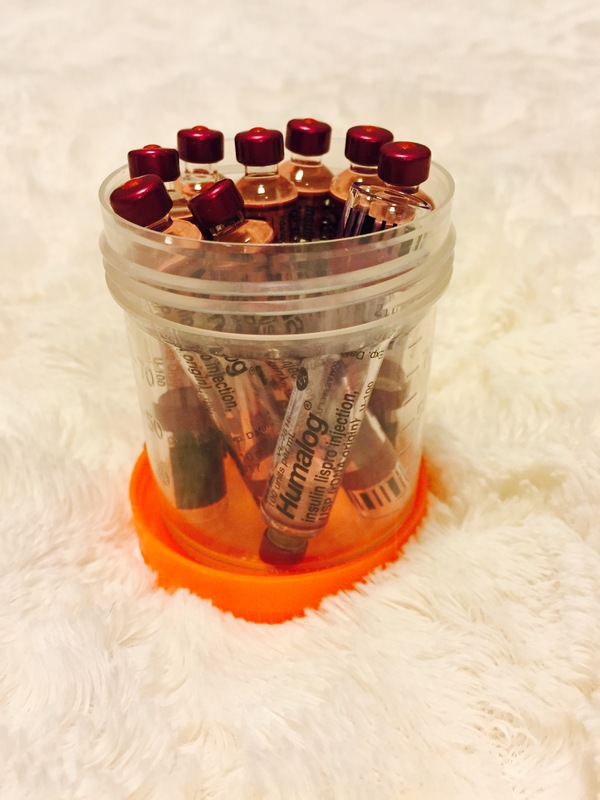 As an anxious person, there have been times in my life where I would perform blood glucose tests upwards of 25 times per day, so my number of pokes is quite large, and it is most likely an underestimate. To figure out my number, I scribbled crazy mathematical break-downs to include “hundreds of shots in this timeframe, then switching to the pump during this year, then testing more or less, etc.” The final number- 166,650– is my very best educated guesstimate. What are your numbers? We are all so much more than the daily pokes and prods, but they have also permanently marked us as strong individuals. Let’s celebrate this concept with others, and let’s vow to find a cure so that the next newly-diagnosed person is not sentenced to years of replicating our needle tallies. When people chomp at the worm on the end of the hook, I will clue them in as to what diabetes is all about. I will explain how it is not caused by cupcakes, how much it pains me to see the worry on my friends’ faces on the bad days, and the other ins and outs of taming a sadistic autoimmune beast every day. Then I will tell them about the good stuff: the #doc, #dsma, the doctors and nurses who have refused to give up, the fact that it is not too late to work towards a cure. When it comes to advocacy this month, do what works for you; support the message that resonates with your own diabetes struggle. If you hear a diabetes joke at the local ice cream shop, politely inform the misguided comedian that his material is outdated based on modern science. Foster a conversation about diabetes with someone who may be misinterpreting what it means. Wear blue. And wear your heart on your sleeve while doing so.